Design is the most important phase in the construction a building. Its level of energy efficiency depends largely on the construction techniques introduced during the design phase and on the materials used. 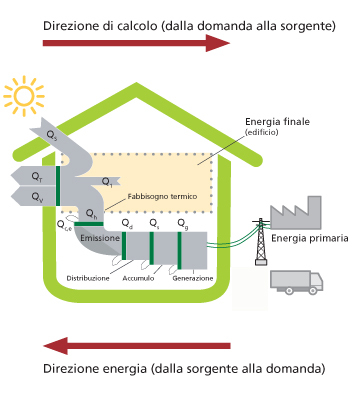 It is possible to achieve a good level of energy efficiency both for new builds using bioclimatic design techniques, and for existing builds through energy improvement works. It is therefore extremely important to be aware of the techniques and materials being used to construct the building. For example, choosing good insulation when constructing the skin (outer shell) of a building helps mediate the cold of winter and the heat of summer, thereby increasing quality of life. In the case of new builds, orientation is a crucial component of energy efficiency. Good orientation in respect of the cardinal points of the compass allows the construction to make the most of the solar radiation to increase its contribution during the winter months, therefore allowing significant energy savings. Fully-integrated and high-performance system engineering is fundamental to the building system.